"Stop Herpes Dead in its Tracks"
Adopting an alkaline diet is the most important step you can take towards suppressing the herpes virus; in fact, detoxifying your system this way will virtually eliminate future outbreaks. This applies to both herpes simplex virus 1 (HSV-1), and herpes simpex 2 (HSV-2). What's more, this is a mere handful of the benefits you’ll enjoy for the rest of your life! This chart shows the relative acidity of various beverages, fluids, and chemicals. Your ideal bodily pH level coincides with blood, which is a little over 7 on the scale. 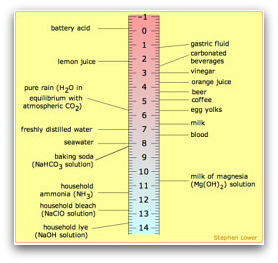 The pH (potential of Hydrogen) scale runs from 1 (most acidic) to 14 (most alkaline). The pH scale is logarithmic. Therefore each value is 10 times more acidic than the adjacent lower value. In other words, with the correct body pH at a little over 7, the herpes virus cannot attack the cellular system and cause a herpes or cold sore outbreak anywhere on your face or body. In his book, 'Never An Outbreak', William Fharel states: "An acidic body provides a biological terrain conducive for disease to proliferate… Maintaining proper alkaline levels is essential for overall good health as well as preventing all herpes outbreaks." Doctor Theodore A. Baroody states in his book 'Alkalize or Die': "The countless names of illnesses do not really matter. What does matter is that they all come from the basic root cause… too much acid tissue waste in the body." Anthony Robbins, the famous motivational guru and author of 'Awaken The Giant Within' states: "Alkalize your body and live a healthier, more energized, and ultimately more fulfilling life. Our acid-alkaline balance is a baseline determinant of our physical health”.